I met Yoko at the summer at Renegade craft fair in San Francisco. I was fortunate enough to be next to her and be introduced to her amazing shop! Her work is quality and each print she picks is so beautiful and unique. Her and her husband both were such down-to-earth and friendly people, her husband was also there at the show with her all day: reminding me of my supporting man always helping out. 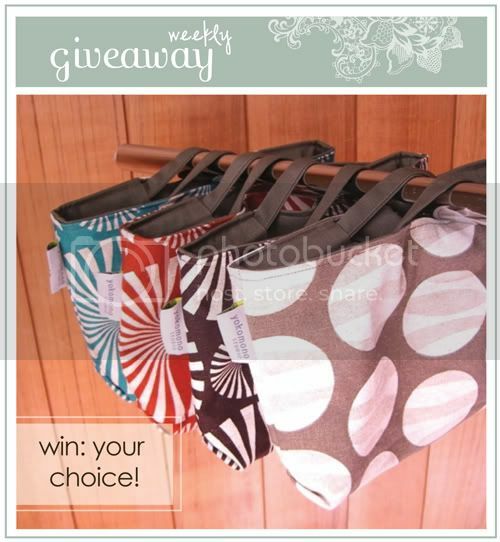 ;) Anyway, today you can win your choice of Polopolo Multi Pocket Pouch or Dokodemo Bag-in-Bag! bag-in-bag, up to a $35.00 value! your entire purchase from yokomono studio! Enter this code and use it till the end of November! Hello! Please tell us a little about you and your shop! I'm a Japanese native and have been living in the Bay Area for about 15 years. I'm married with an 8 year old daughter & a little mutt dog named Lulu. We live in Berkeley, California. Yokomono Studio specializes in modern bags and home accessories with a Japanese aesthetic. Blend 2 parts mid-century modern with one part functional Tokyo subway system and stir! All Yokomono Studio items are conceived, cut, sewn, and stitched by me in her Berkeley, California studio. My one and only goal is to create unique, well designed, handcrafted items that make their owners happy. Yokomono Studio was opened November 2001 -- she is one year old this month! How did you get started sewing? I've always liked making stuff. My earliest "creative" memory is of sewing stuffed animals when I was around 10. After graduating from college and embarking on a wildly uncreative life as a software engineer my daughter came along. As I imagine is the case with a lot of new mom's, this sparked a creative re-birth. I started making clothes for her and bags for me to carry around all of the requisite baby stuff. Please tell us about all your beautiful fabrics and prints! Where do you gather the inspiration from? My fabrics are made by a small upholstery fabric maker in the U.S. That's why all my fabrics are very sturdy. I select the prints that fit my taste from their collection. Whenever I go to Japan, I pick fabric there too. Inspiration might be too strong a word but I really enjoy combining the logic and simplicity of the so-called "mid-century" aesthetic with my own ingrained Japanese design sensibilities. It's not easy to find the fabric that has clean modern/retro color & style, and I spent hours sourcing fabrics. I wish I could design fabric, but I'm not talented in the graphic design field. I cannot even draw a thing! Any helpful advice for those wanting to start their own business? I think that being surrounded by good people who are constantly offering up encouragement is very important. When you first get into this you will likely be racked with doubts on a fairly regular basis. If not for the encouragement I've received from others I'm sure Yokomono Studio would have fallen by wayside long ago. This really goes hand in hand with the whole cliché of "believing in yourself". Cliché but nonetheless very very true. giveaway ends on monday, november 30 at 8am, pst. ooo I love her shoulder bags! I love the Dokodemo bag-in-bag in brown square. Hope I win! Oooh, I just love the Patapata shoulder bag! What fantastic colors! Her shop is just gorgeous! bag-in-bag in the sunflower brown!! ooh what a great giveaway!!!! very hard to decide but my favorite one is the Polopolo Multi Pockets Pouch!!! 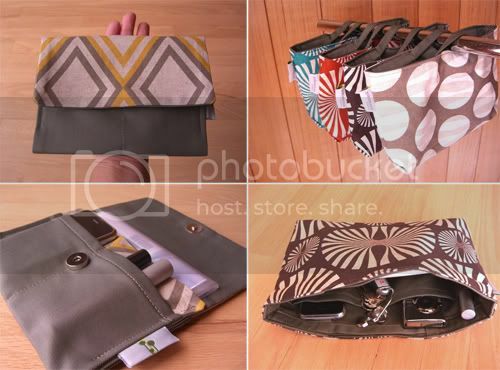 love the pocket pouch in the yellow & grey :) she's so talented! The shoulder bag is just soooo awesome! My favorite item in the shop is the Pakupaku Lunch Bag - Blue! So cute. I love the Dokodemo bag-in-bag in Diamond - Mustard Yellow! Ooh, I love her lunch totes and wine bags! So handy! I love both of them, but I think the bag-in-bag is my favorite. It would definitely be useful! It normally takes me so long to switch purses, and this would make it a lot easier. I LOVE the dokodemo bag in a bag. such a clever idea. I've been searching for the best pouch to go inside my purse.. I think this is it! I love the polka dotted Polopolo Multi Pocket Pouch. SO CUTE! I adore the lunch bag and the bag in bag!!! Both are so cute and functional!!! what a fun giveaway! 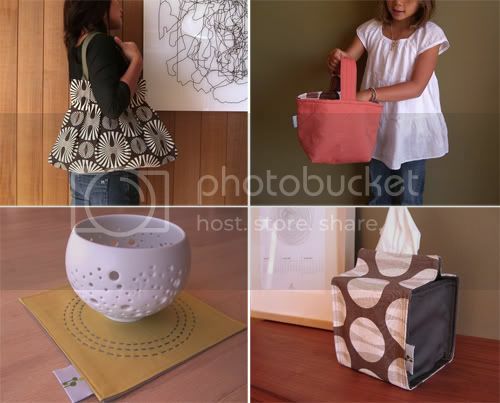 i love the pakupaku orange lunch tote...too cute. thank you for the opportunity! Love the Polopolo Multi Pockets Pouch in diamond - vintage mustard. So cute! LOVE the shoulder bags! such great fabrics! I have been wanting one of the polopolo pouches forEVER!!! The Polopolo bag in Taupe/Gray Dots is cute. I love all of the bags and would be so happy to win this giveaway! I also blogged about it at new blog ART AND DESIGN! This is an awesome giveaway! I LOVE the Dokodemo bag in bags! I'm such a fan of her work and fell for the tissue box covers first, but really it is all lovely. I love the simplicity of her fabric and designs..So beautiful.I have to say my most favorite piece is the polopolo pouch..It would make looking for the important items in my bag(suitcase my hubby calls it) so much easier to find.. These bags are fantastic! Thanks for the giveaway! My fave is the Patapata Shoulder Bag (Type 2) - Square. The pattern is amazing. I quite like the Patapata shoulder bag and love that she'll customize the strap length because I always need longer straps. I love the Bag-in-Bag too — both the idea and the actual product. i love the dokodemo bag-in-bag in Diamond Mustard Yellow fabric. i have been looking for something like this for a long time!! Love the bag in bag, but the shoulder bag is divine too! I love this bag: http://shop.yokomonostudio.com/product/patapata-shoulder-bag in yellow. I'm trying to somehow justify it to myself! I love everything, but the Polopolo Pocket Tissue Holder is definitely my favourite! It's a tissue holder but so much more! Genius!!! LOVE the Patapata Shoulder Bag (Type 2)! love the polopolo tissue holder! ooh I've liked this shop for a while! Patapata Shoulder Bag (Type 2) is my favorite!!! love the type 2 shoulder bags! thanks for the opportunity! I love the big tote. You can never have enough bags. I love the Multi Pockets Pouch in Diamond- Mustartd Yellow! <3 Happy Holidays! The bag in bag in Diamond-Mustard is awesome!!! Great giveaway. Love the polopolo wine tote! You can never have too many stylish wine bags! ooo... i love the Dokodemo Bag in Bag. Oh I love that shoulder bag!! So adorable, beautiful items. I'm a bit of a fan f this store so would love to win! My favourite is the "Poipoi Big Tote". polopolo multi pocket pouch! or maybe the large mustard tote. everything is fantastic. love the materials. I love the orange lunch bag. So cute! I love the Patapata shoulder bags!!! and the Dokodemo bag in bag!!! the fabrics are amazing!!! Dokodemo Bag in Bag is such a clever idea!!! I love the Dokodemo Bag in Turquoise! I would use this as a regular clutch, too! Would LOVE to win. These are all adorable and I love organization! My favourite item is definitely the Patapata shoulder bag (type2)! the wine tote is darling! great giveaway!! i'm diggin' the dokodemo bag in a bag! genious! Gorgeous things! I love the Patapata shoulder bag! What a fun print! The Patapata bags are the cutest! I'm kind of in love with the Patapata Shoulder Bag (Type 2). What a beautiful design! I love the Bag in Bag! How perfect for keeping all my travel essentials together for the airplane! Oh I adore the bag-in-a-bag concept! Definitely my favorite item! LOVE the Patapata Shoulder Bag, Type 2. Her work is really terrific! I really love the bag in bag! awesome idea! I LOVE LOVE the Lunch bags! I would love to get one for my kids! i love the multi pockets pouches! would be an awesome gift for my sister! I love the large shoulder bags - her prints are so colorful and unique! The shoulder bags are fabulous! Love them! I twittered it! Huraah! Hope I win! oooooooh, I love the patapata shoulder bag so cute. And I totally love her aesthetic -- all the products look almost yummy! Ooooo! I LOVE everything she makes! I love even more that I share 3 commonalities with her... we're Japanese, from the Bay Area, and CRAFTY! :o) Thanks for introducing me to her handiwork. I am LOVING her Pakupaku Lunch Bag. ooh what a cute shop, i love the lunch bags they are adorable. Gorgeous bags...i adore her bag in bag! Thanks for such a wonderful giveaway! :) Have a lovely merry happy day and a wonderful thanksgiving! Love to you! Being a bento enthusiast, I absolutely adore the lunch bags! So many nice things, but I think I like the Patapata shoulder bag best! First I love love love the bag-in-bag, because that's really clever. Every woman I know has to dig and dig and dig in their purses for their chapstick/mail box key/etc. BUT the thing that really calls to me is the kurukuru coaster! I just got the most perfect heywood-wakefield coffee table, and I'm sorta a freak about not letting anybody set anything on it, and I really want to put a big vase of flowers on it. I think this is exactly what I need! I also posted this on my twitter and my facebook! Dokodemo Bag in Bag in Coffee Brown! her shop is very cute! I love her shop! The Patapata bag is absolutely beautiful! i LOVE the bag in a bag, i always carry large handmade bags and there's never enough pocket space, this would be great, my fave is the diamond mustard!! Love the patapata shoulder bag, but also love the polopolo. Actually, love them all. Oh I love the Polopolo wine tote...almost as much as I love a good glass of wine! 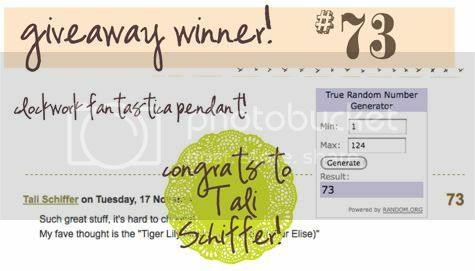 such an awesome giveaway and shop! I love, love, love the Patapata shoulder bag! My favourite is for sure the Polopolo Multi Pockets Pouch! I think that my sister would love one of those for Christmas! Ooh, I love her Patapata shoulder bags! So awesome! aw i really like the pouch because of all the compartments in it. it would be perfect for traveling! thanks for the discount and the opportunity to win! I love the Poipoi Big Tote in Mustard yellow. Happy Thanksgiving! I love all of them, they are beautiful! Happy Thanksgiving! i love things with pockets for little things, so my fave is the multi-pocket pouch! love all the fabric patterns! I love the dokodemo bag... permits you to be so neat and organized! Your tissue box never looked so good; this polopolo cover is great! Such a cute shop! The Polopolo multi pockets pouches are darling! Love the bag in a bag@!! I would love to sport one of her bags, they look like they are crafted well. I really like the bag in bag, the dotted one in particular. Joined your blog, love it. I became a fan on face book, sent out invitations to my friends and posted you on my blog roll becauseshesaidso through google. Thanks for this very generous givaway. I love the Patapata Shoulder Bags...they are sooo cute! great fabrics make me smile, smile really, really big! i love the patapata shoulder bag. Really Nice bags! I like the flat bags on the 2 pics, really cute! You have a beautiful blog! I have to say, the Pakupaku lunch bag is adorable! love all the multi pocket pouches... Oh, the things that could go in there!! All these bags are super cute! I love all the bags, but the Patapata Shoulder Bags is my fav. My favortie is the Patapata shoulderbag!!! thanks for showing this cool shop, I love all her creations! I love the bag in bags, I feel like sometimes my purse can be a never-ending blackhole, this would make like so much easier! Such a cute shop and the fabrics are beautiful! I love the bag-in-bag in turquoise sun! What a good idea! love the patapata shoulder bags! oh their lunch bags are so cool! i love the multi pocket pouches!! can use it for anything! I liked the multi purpose pocket pouches!!! i absolutely love her dokodemo bag and the patapata shoulder bag. I love how the shoulder bag has a water bottle holder! I like the idea of the bag in bag, and also the Poipoi Big Tote with lots of space! I love the Patapata bag with the Dokodemo bag-in-bag inside! They're all so beautiful! It's also posted on my blog! Thank you for a great giveaway, Danni and Yoko! I love the Pakupaku Lunch Bag in Blue! You find such lovely things. I love her Dokodemo bag in a bag. Perfect product. Oooh, the Patapata Shoulder Bag is absolutely gorgeous! her wine bags are divine!!! I think the Dokodemo Bag in Bag is genius! Just what I've been looking for! oh my my, I love all her stuff! especially the Dokodemo Bag in Bag, it's perfect! I'd love to win either, but I could really use a new bag! The patapata shoulder bags are amazing! oooo...i heart the patapata shoulder bag!!! preeeetty!!! I love the patapata shoulder bag! Beautiful and so useful!